President Benigno Aquino has travelled to areas in the southern Philippines devastated by a powerful typhoon that struck earlier this week. Meeting survivors in New Bataan, the scene of deadly flash floods, he said efforts had to be made to ensure such a disaster was not repeated. A total of 418 people are now confirmed dead and another 383 remain missing, official figures show. More than 300,000 people are currently staying in evacuation centres. 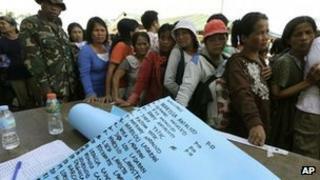 Typhoon Bopha struck the southern island of Mindanao on Tuesday. High winds and heavy rain damaged a swathe of the island, but the worst-hit areas were two eastern provinces, Compostela Valley and Davao Oriental. In New Bataan, in Compostela Valley, several buildings - including emergency shelters - were washed away or buried by flash floods and mudslides. "We want to find out why this tragedy happened and how to keep these tragedies from happening again," Mr Aquino was quoted by AFP news agency as telling local residents. "I am here to listen and hear explanations. This is not a time for accusations. It is a time for work," he said. The typhoon destroyed almost 16,000 houses, the National Disaster Risk Reduction and Management Council said, forcing families to seek shelter elsewhere. Damage so far has been estimated at 4bn pesos ( $100m, £60m). A local military commander told Reuters news agency that recovering some of the bodies was hard because they were buried in mud, and troops had no specialist equipment. Compostela Valley Governor Arturo Uy said that mass graves could be dug for victims of the typhoon who had not been claimed by relatives. The Philippines is hit by several typhoons each year but they usually strike further to the north. Last year, Typhoon Washi left more than 1,300 people dead when it struck northern Mindanao, causing rivers to burst their banks. Ahead of this typhoon - which was stronger than Washi - the government issued warnings, with Mr Aquino appearing on television to urge people to take the storm seriously. Troops were sent to help out with evacuations and rescue personnel deployed in advance.